Culms: Erect, sparingly branched, hollow, glabrous or pubescent at nodes. Blades: Flat or rolled inward, narrow, 2 to 16 inches long, less than 1/3 inch wide, conspicuously ridged, glabrous or rough. Sheaths: Usually longer than internodes, open, glabrous or rough, conspicuously veined. Ligules: Membranous, tips pointed, notched at top. 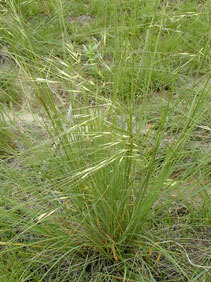 Inflorescences: Narrow panicles, contracted or open, 4 to 20 inches long, bases usually enclosed in uppermost sheaths; branches slender, ascending. Spikelets: Borne near tips of branches, 1-flowered, drooping at flowering; glumes .5 to 1.5 inch long, 3-5-nerved, tapered to slender tips; lemmas to 1/2 inch long, pale to brownish, lightly pubescent, stiff-hairy at bases; awns 4 to 8 inches long, bases with tiny crown of hairs, tightly coiled below, loosely coiled or zigzag near ends. Habitat: Dry prairies and pastures, on well-drained sandy or rocky soils. Distribution: West 1/5 of Kansas. Forage Value: Needle-and-thread has fair to good forage value for livestock prior to fruiting. Uses: The Blackfoot noted the appearance of this grass to determine the best time to hunt bison. Comments: Densely tufted. The awns can cause injuries to eyes and tongues and can contaminate wool.